NOTE: Symbol appearance may vary on your mobile device. The font used for final engraving will be Arial Unicode MS.
30 years in the making - the latest generation of Littmann Cardiology stethoscopes has arrived! As with the Cardiology III, full acoustic range adult and pediatric auscultation is available through its newly designed dual head chestpiece. Simply rotate the central spline to alternate between the two sides for superior adult and pediatric auscultation. The brand new single piece diaphragms (unique to the Cardiology IV), have further optimised acoustic sensitivity, making all sounds clearer and easier to hear! The new long life binaural (two tubes in one) are the very latest specification, and latest materials, helping raise the warranty length to an industry leading 7 years! The selector spline is now recessed to allow a perfect flush fit with the binaural tube, now featuring a visual indicator for easy identification of the operational diaphragm. Did we mention it can be engraved too? NEW: The very latest in the standard for dual head cardiology technology..
NEW improved high frequency acoustics – the all new design allowing greater access to high frequency heart sounds. NEW unique diaphragm designs – newly designed, fully optimised, adult and pediatric diaphragm offer a full range of auscultation sounds. NEW next generation long life tubing for greater longevity with a double lumen (two tubes in one) design to minimise external friction sounds. NEW 100% latex free construction – for increased patient comfort, durability and lifespan. NEW single piece diaphragm technology – easier to clean than ever before providing greater infection control properties. NEW 7 year warranty – class leading 7 year guarantee from date of purchase. Spare parts kit included – spare small soft sealing eartips, large firm grey eartips, and non chill bell sleeve are included as standard. 3M’s ‘Tunable Technology’ lets you easily switch from low to high frequency sounds by switching from light to firm pressure. Double-sided large/small chestpiece for both adult and pediatric assessment. For maximum versatility the reverse side is also easily transformed into a traditional open bell with the supplied adapter. Laser engraving of text and symbols to personalise your scope and avoid theft/loss. Anatomically designed headset comfortably positioned for optimal sound transmission. Comfortable Snap-Tight soft seal eartips create an excellent acoustic seal to reduce ambient noise. 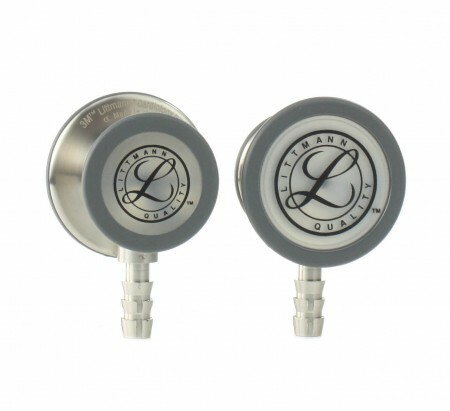 Littmann performance rating of 9 out of 10. Apply firm pressure with the small floating diaphragm. Easy-remove diaphragm permits bell mode with adapter provided. Easily interchangeable between open bell and tunable diaphragm, giving three possible functions. Medisave offer a laser engraving service on all of our Littmann stethoscopes (and many other items of diagnostic equipment). Because we recognise the value and quality of your tools we have invested in the highest quality equipment and technicians to give you probably the finest engraving service available (superior to our competitor’s more expensive efforts). The end result is an elegant, permanent, precision mark on the surface of the chestpiece, allowing you to show a little of your personality and, more importantly, deterring thieves and making it easier to retrieve your scope should you misplace it. The service does not delay your order and next day delivery services are available.